For those without the time to browse all 213 slides, we've picked out they key points for marketers, just as we did last year, so you can stay abreast of the latest trends. We saw last year that mobile outstripped desktop for the first time when it came to web traffic. This year we see Smartphone use continuing its strong growth, but now the biggest markets are in developing economies. 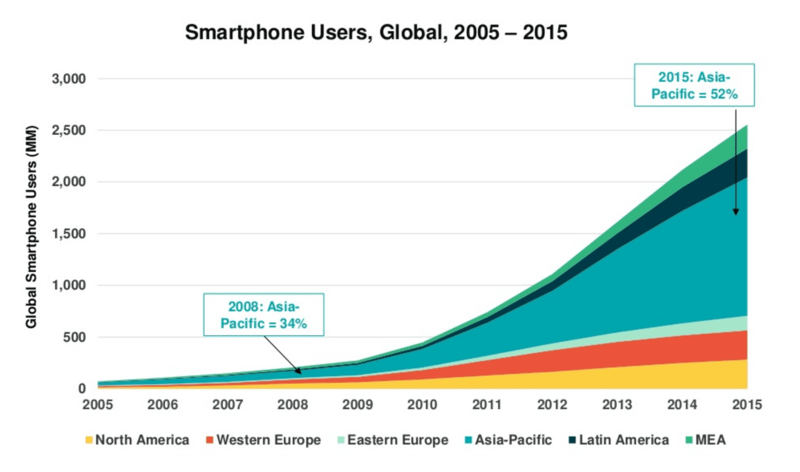 Asia now makes up over half of the entire global smartphone user base, something marketers should bear in mind when looking to enter new markets in this region. It also has implications for those already marketing in Asia. If you haven't already adopted a 'mobile first' approach your customers may go elsewhere, given that they're highly likely to be using mobile devices to view your content. Five years ago mobile advertising was very much a fringe activity that made up a tiny percentage of ad budgets. We're literally talking pennies on the dollar. Now in 2016 with over half of web traffic coming from mobile devices, it's finally starting to mature. With over £20 billion in spending in the US alone, mobile internet advertising now accounts for a 3rd of all internet ad spend. 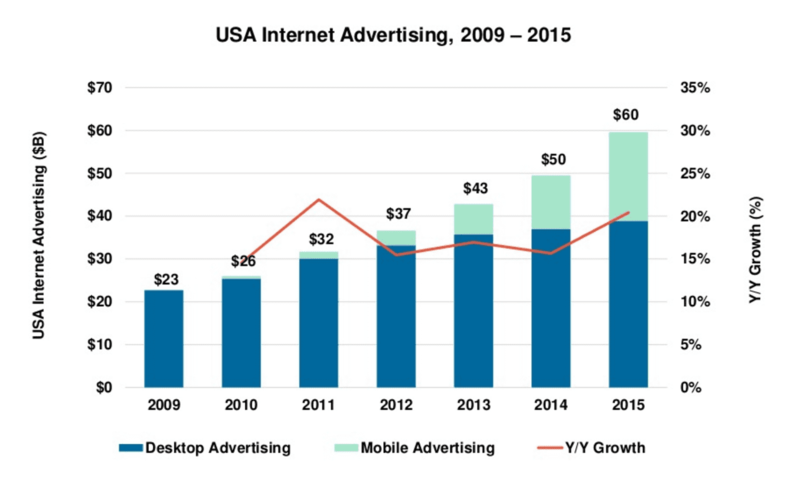 This graph also shows the strong growth in digital advertising more generally. The rate for 2015 was the highest ever by a healthy 10 billion margin, and year on year growth also ticked up last year to a rapid 20%. The two giants of digital are solidifying their positions as market leaders in the online ad space. 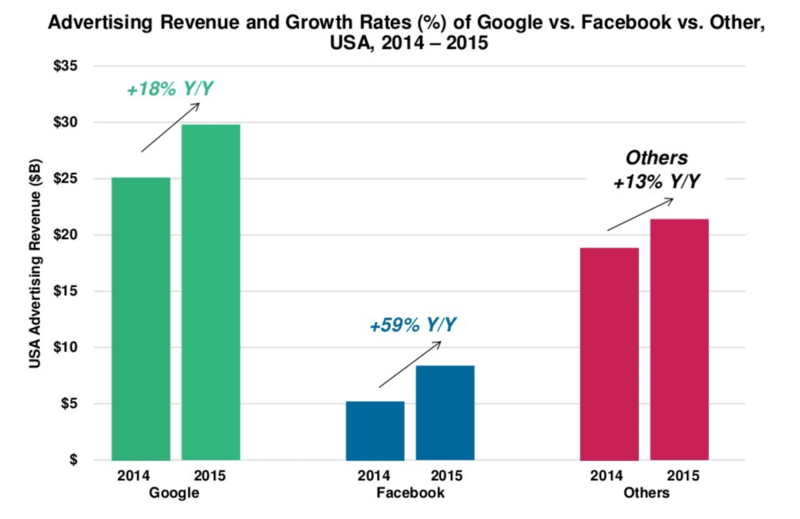 Facebook managed a whopping 59% year-on-year growth last year, taking ad revenues to $8 billion, whilst Google still dominates the market, earning almost $30 billion from PPC ads, as much as all other platforms combined. As these platforms grow larger and more powerful, they'll be able to exert more and more control over ad markets. Facebook has already announced a plan to allow businesses to leverage their user data to deliver targeted ads on other sites, which would be purchased via Facebook. It's a testament to the value of user data and may be a valuable option to consider when looking at where you allocate your digital ad budgets. You will know about the growth in adblocking on desktops in the statistics we have shared. 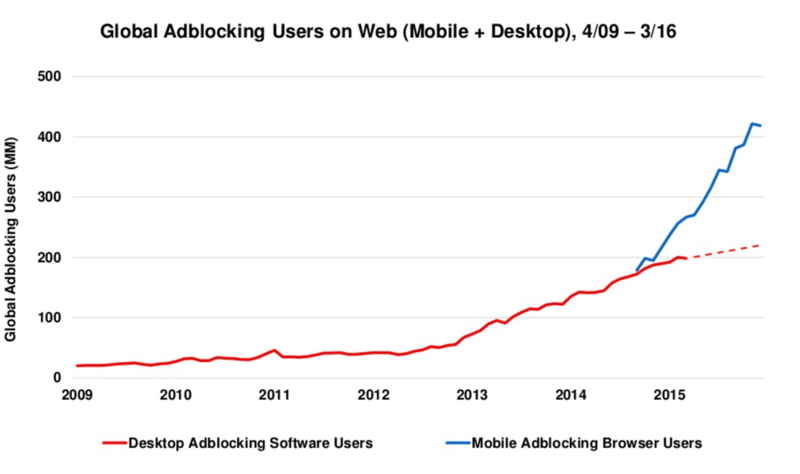 Yet only a year or so ago mobile ad blocking was very rare. Desktop ad blocking had growth massively in popularity but wasn't really an option for most mobile users. That all changes last year, and mobile ad blocking rates soared. Some 200 million more people are now blocking ads on their mobiles than they were last year. That's equivalent to the entire population of Brazil! Advertisers will increasingly have to get around this via either in-app advertisements or using 'advertorials' which circumvent ad-blockers by appearing in the same format as native content. Ecommerce growth is hardly a new trend, but it is worth mentioning the continued high growth in the sector. American spending online reached a massive $340 billion last year, up considerably on last year. 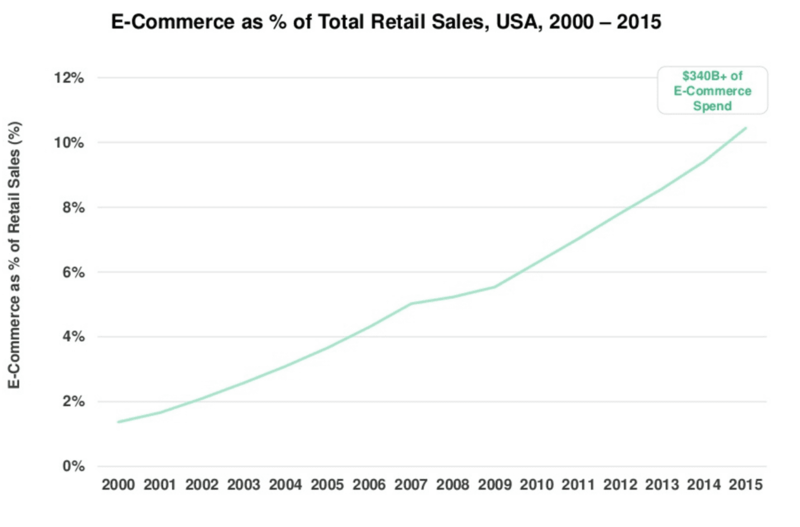 Ecommerce now makes up over 10% of total retail sales, not a bad chunk of the market, but one that leaves it with plenty of room to grow. A few years ago online video meant YouTube, and maybe Vimeo and Daily Motion for the really switched on. This has all changed over the past couple of years as video has gone social as social sites have woke up to the potential of hosting videos on their own platforms. Facebook's daily video views have shot through the roof over the course of last year, reaching a massive 8 billion per day by Q3 last year. 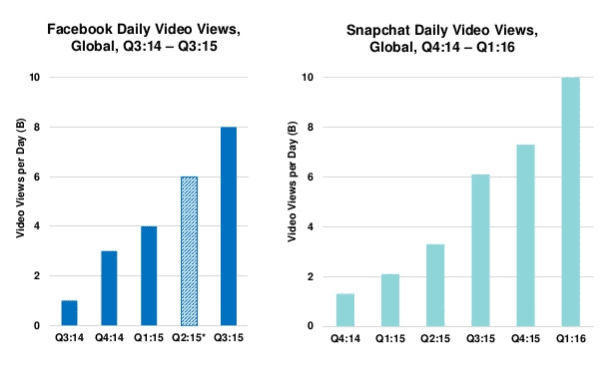 Snapchat has done even better, growing tenfold over the course of a year to an astonishing 10 billion daily video views. From almost nothing in 2012, Snapchat has grown spectacularly in just a few years to account for over a third of total daily photo shares. Facebook continues its growth but has been someone overshadowed by the messenger platform WhatsApp (Owned by Facebook) and Snapchat, whose photo's are deleted as soon as their viewed. Snapchat looks like it dominates photo sharing according to this chart, but marketers must not rush to the platform without a strategy. The whole point of Shapchat is the photos are only viewed once and then discarded. It's great for reaching millennials with certain B2C products, but if you're a B2B business the chances are Snapchap isn't going to be delivering much in the way of ROI anytime soon. 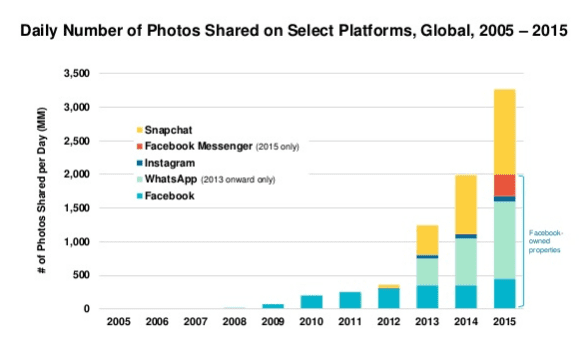 We've seen messaging apps like WhatsApp and Snapchat growing massively in photo and video sharing. The trend towards communicating with friends via messaging apps rather than broadcasting to one's social networks really picked up steam. Monthly users of messaging apps have increased massively over the last couple of years, with WhatsApp reaching a massive 1 billion people and Facebook Messenger and WeChat not far behind. 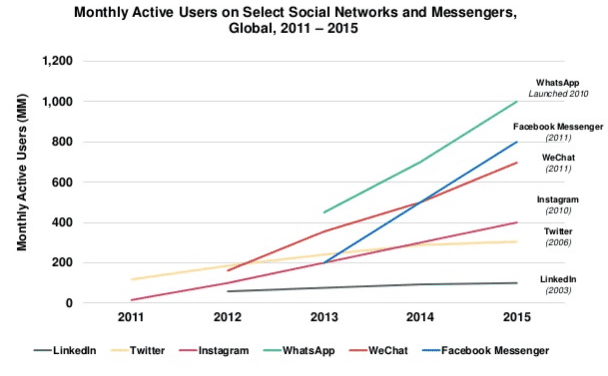 As you can see from the chart, these messaging apps are now considerably outstripping established Social Networks like LinkedIn, Twitter and Instagram. Working out how to monetize these platforms will be the key challenge for their owners in 2016 and beyond. How they decide to do so will affect marketers immensely. 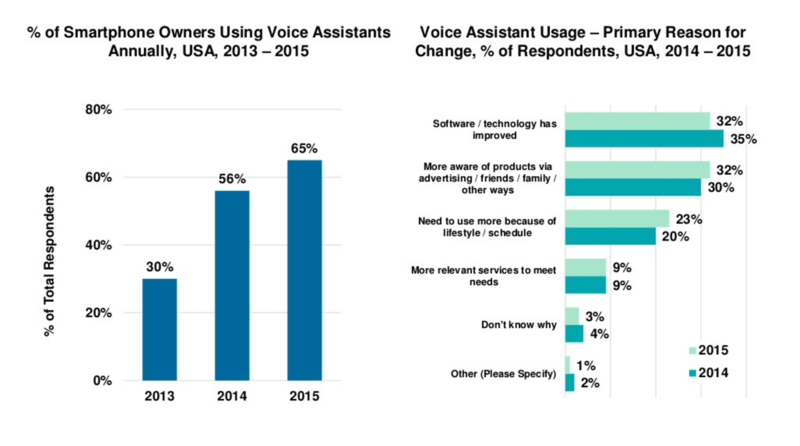 As the technology has improved voice assistants have more than doubled in popularity, being used by 65% of smartphone users in 2015. The implications for search are massive, as people will be increasingly interacting with their search engines via their mouths rather than their keyboards, which will significantly change the way people look for information. There you have the key trends for marketers this year as we seem them. There is a lot more detail to dive into in the full deck if you're interested, much of it macro economic data. The trends range from emerging market debt, fertility rates and all other kinds fun economic indicators that aren't strictly relevant for us marketers, but still interesting none the less. Or maybe it's just me that feels that way. See our compilation of Internet marketing statistics sources for what we see as the 10 best sources of year-round insight to inform your digital marketing strategy.